Groups That Pushed Late Changes For Environmental Regulations Had Previously Spent Millions Of Dollars To Support State Lawmakers’ Campaigns, According To Analysis. 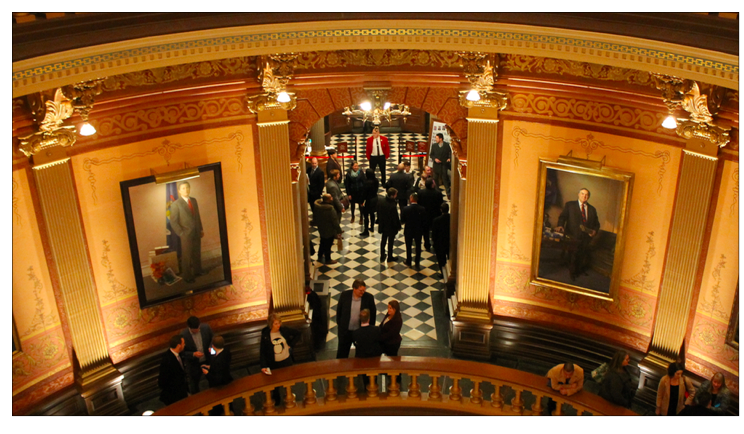 LANSING (DEC. 21, 2018) — A handful of pro-business groups that also happen to be major campaign donors helped lead a lame-duck push in the Michigan Legislature to change environmental policies. Political action committees (PACs) connected to groups backing five environmental bills have spent $3.01 million in support of current lawmakers and their caucuses over the last five years, according to an analysis of fundraising disclosures and meeting minutes. While many of the contributions happened well before the 2018 bills were introduced, they point to the relationships between lawmakers and groups that were urging them to change regulations covering things like wetlands and radioactive waste. 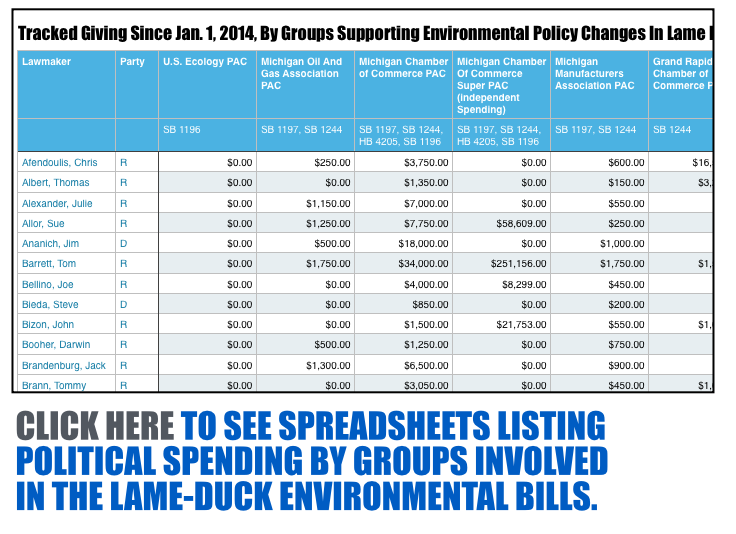 A full breakdown of spending by groups in favor of environmental bills moving in lame duck is available here. The lame-duck session occurs after the November election but before term-limited lawmakers and lawmakers who lost their campaigns have to leave office at the end of the year. During a meeting of the House Michigan Competitiveness Committee on Tuesday, representatives for the Michigan Chamber of Commerce spoke in support of a 50-page bill establishing new guidelines for cleaning up contaminated sites, saying it would help ensure more of the sites are developed. Since Jan. 1, 2014, the Michigan Chamber of Commerce’s main PAC has given $79,500 combined to the fundraising accounts of the six Republicans on the committee. “We can’t get this done thoughtfully here in lame duck,” he said. The House Michigan Competitiveness Committee approved the bill on Tuesday. Then, the full House approved it later that day. It’s now before Gov. Rick Snyder for his signature. Like business groups, environmental organizations also make contributions to candidates. But they tend to give much less money. The League of Conservation Voters has a PAC and a super PAC. The Michigan Sierra Club also has a PAC. Those three PACs have combined to spend $222,804 in support of current lawmakers and their caucuses since Jan. 1, 2014. The Michigan Chamber’s PAC and super PAC have spent about $2.01 million in support of current lawmakers, Snyder and Lt. Gov. Brian Calley over that time, according to an analysis of campaign finance disclosures. The spending totals include giving to lawmakers’ campaigns and caucuses, giving to lawmakers’ personal PACs and independent expenditures in support of the lawmakers. According to committee minutes, other groups that have supported Senate Bill 1244 include the Michigan Oil & Gas Association, the Grand Rapids Area Chamber of Commerce, the Michigan Petroleum Association and the Michigan Manufacturers Association. 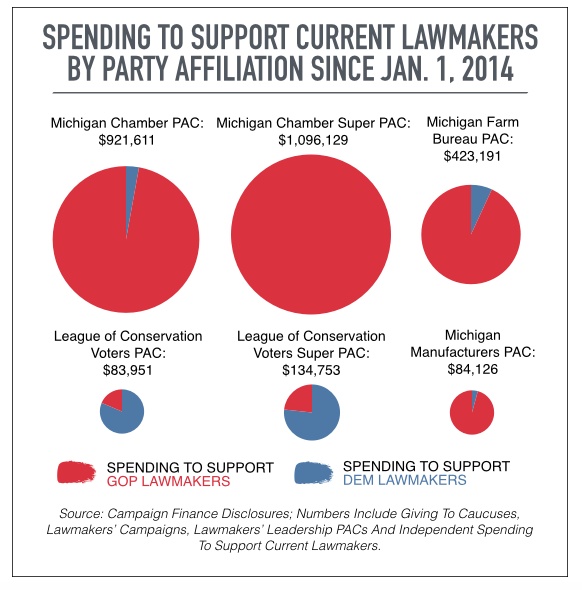 Since the start of 2014, the Michigan Oil & Gas Association PAC has spent $124,000 in support of current lawmakers, the Grand Rapids Area Chamber’s PAC has spent $11,150, the Michigan Petroleum Association’s PAC has spent $175,020, and the Michigan Manufacturers’ PAC has spent $84,126. The numbers don’t include contributions to candidates for the Legislature who lost or are no longer serving. During Tuesday’s committee meeting, representatives for the Michigan Farm Bureau and the National Federation of Independent Business (NFIB) spoke in support of a separate bill that would decrease the number of wetlands with environmental protection in Michigan. Charlie Owens, state director for NFIB, said the bill would level the playing field between citizens and the Department of Environmental Quality. The committee approved the bill, w88 dashboardSenate Bill 1211. Lawmakers revised the proposal on the last night of the lame duck session before sending it to Gov. Rick Snyder for his signature. The revisions would maintain protections for more wetlands than the original proposal, w88 dashboardaccording to media reports. The Michigan Farm Bureau’s super PAC has spent $10,116 in support of current lawmakers since Jan. 1, 2014. The Farm Bureau’s PAC has spent $423,191 in support of current lawmakers. The NFIB PAC has spent $60,680 in support of current lawmakers. Business groups have also supported w88 dashboardHouse Bill 4205, which limits the ability of state agencies to adopt rules that are stricter than federal standards, and Senate Bill 1196, which sets guidelines for dealing with radioactive waste in landfills. A representative for U.S. Ecology, a company which has a hazardous waste disposal facility in Belleville, testified in support of the radioactive waste bill. The bill has passed both the House and the Senate. U.S. Ecology’s PAC has spent only $2,250 in support of current lawmakers, according to disclosures. The company has also made at least two corporate contributions to administrative accounts this year, including giving $1,500 to Sen. Mike Shirkey’s Grand Lake Administrative Fund on March 25, 2018, and $1,500 to Sen. Mike Kowall’s Prosperous Michigan Fund on Feb. 1, 2018. Those accounts file disclosures with the Internal Revenue Service. But many administrative accounts don’t have to file disclosures because they don’t hit the reporting threshold of raising $50,000 in a year. A fifth major environmental bill in lame duck with support from the business community was Senate Bill 1197, which allows for the creation of a utility tunnel in Straits of Mackinac to house Enbridge’s Line 5 pipeline. It’s a pipeline that some Democrats want to shut down. Snyder has already signed that bill into law.